Today at the Consumer Electronics Show (CES) in Las Vegas, Verizon Wireless announced V CAST Mobile TV and two new phones to go along with it. The upcoming service will allow subscribed customers using either of the two new phones to watch standard TV channels “on-the-go.” Verizon Wireless is expected to launch Mobile TV by the end of March ’07. If you are wondering if this is different from the current V Cast Video, it is completely different. The currently available service only allows viewing short clips from major broadcasting networks, while Mobile TV will allow watching the same live broadcasted content you receive 24 hours a day on your regular TV. During the initial launch only certain TV channels such as CBS, Comedy Central, Fox, MTV, and NBC will be available, but more are expected to added the lineup soon after. Also since the content isn’t “on demand” you will need to check a program guide. This very similar to the grid guides found on Cable or Satellite TVs for finding timings when shows are aired. The schedules can be found on any Mobile TV enabled phones. The first two phones to support this new service will be the Samsung SCH-u620 and the LG VX9400. Both phones feature a large and bright LCD display for viewing Mobile TV content. Also along with the new service, the phones will continue to support the “NOW standard” features such as V CAST Music/Video/Games, Mobile Web, and Get It Now. 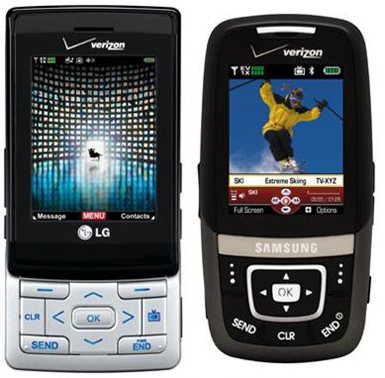 The two phones feature a 1.3 megapixel camera/camcorder, Bluetooth (stereo headset support), speakerphone, and microSD expansion for music storage. A neat multitask feature will mute media (or pause if music) when a phone call is received and continue playback right after hanging up. Verizon Wireless has stated that pricing for the V CAST Mobile TV will not be available until the service is actually launched. The current V CAST service costs $15/month so they will probably charge another $10. And as for the two phones, the pricing hasn’t been set yet, but will be available in the weeks prior to launch. I’d expect both two be quite pricy because of the new features, but hopefully below $200 with a new plan. P.S. Check back for more CES and Macworld 2007 Coverage throughout the week! 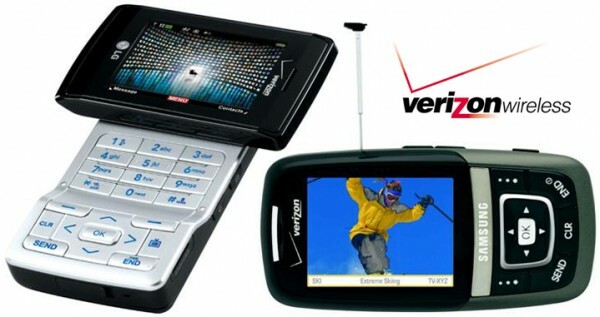 this phone is so sickkk i want it, but i cant choose between this phone or the chocolatee! damn i hate this phone cuz it’s the one i have right now but it’s too damn not good lol……….